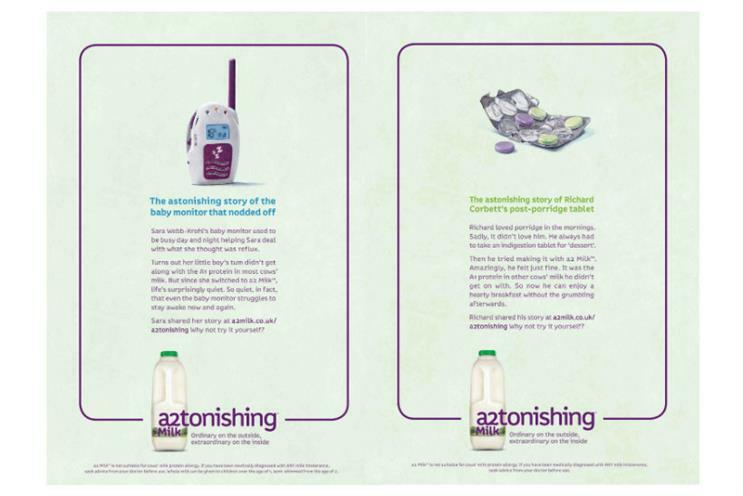 A2 Milk, a brand of cow's milk that only contains certain proteins, is getting a new above-the-line campaign this week pushing the drink's "astonishing" properties. The campaign, created by Aesop for the A2 Milk Company, tackles common complaints with standard dairy, such as getting a bloated tummy and indigestion after drinking cow’s milk. Aesop was tasking with creating a brand awareness campaign to convey the benefits of A2 Milk, which only contains the A2 protein, rather than the more common A1 protein. The campaign launched on 5 June, and will run in Guardian Weekend, You Magazine, Hello! and Waitrose Magazine, plus online with Netmums. It comprises four executions with original art from Joel Penkman, relaying customer experiences of drinking A2 milk. Martin Grimer, executive creative director at Aesop, said: "When we delved into the extraordinary history of a2, we found a plethora of customer testimonials that we decided to bring to life with astonishing stories and astonishing creative. "It’s a campaign full of surprises that doesn’t adhere to the category norm." Scott Wotherspoon, chief executive of the A2 Milk Company, said the brand introduces "another choice for people that don’t get on with regular cows’ milk."